One of Canada’s biggest banks has given the Toronto housing market a checkup, and by most counts the market appears healthy. Despite bubble talk and headlines warning of a real estate crash, Toronto’s housing market outperformed two of the four major markets RBC analyzed in its latest Canadian Housing Health Check. The bank looks at 10 measures: affordability, both rental and resale market balance, interest rates, labour market, demographics, and new home inventory and homes under construction, each in the single-family and multi-family segments. “There are worrisome signs of overheating in the GTA market,” write Craig Wright, the bank’s chief economist, and RBC Senior Economist Robert Hogue, in the report. “The surge in property values has become widespread across all housing types and areas within (and outside) the GTA,” the economists continue. However, Wright and Hogue call Ontario’s Fair Housing Plan, which was unveiled last week and includes a Vancouver-like foreign-homebuyer tax, “generally a positive measure” with the exception of expanded rent control. 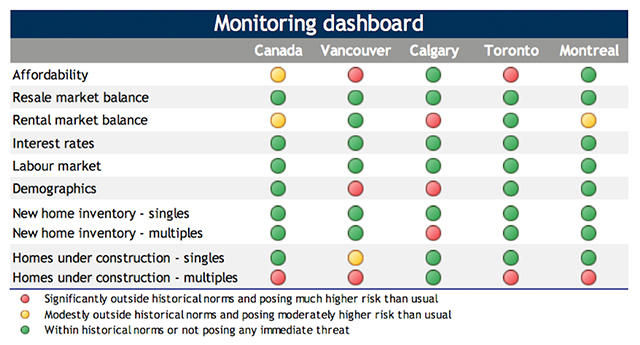 Vancouver and Calgary both received three red flags over Toronto’s two. The former got poor marks for affordability, demographics — which includes employment, for instance — and the overabundance of multi-family homes being built. Calgary problem areas were an unbalanced rental market and an overabundance of new, unsold homes. On a national level, RBC suggests it’s unlikely Canada will suffer from a sharp housing crash or correction over the next year. “However, [the risk] has increased due to increasing evidence of overheating in Ontario,” the economists note.